This dish makes a tasty weeknight dinner and is even better as a leftover. 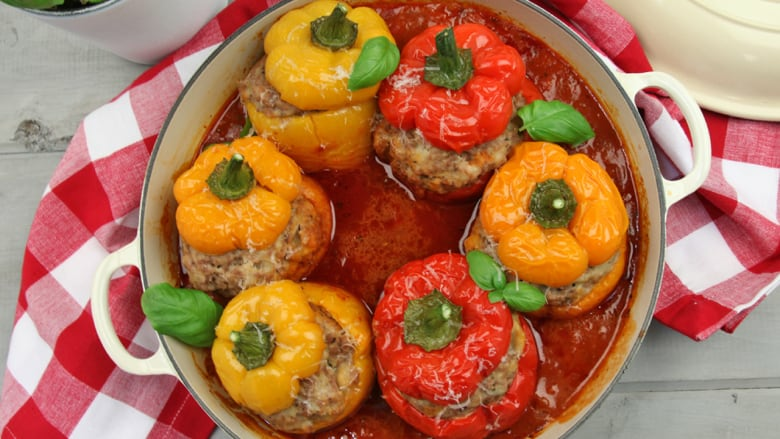 After his date with Lidia Bastianich, Shahir was inspired to make her recipe for stuffed peppers. Heat a dutch oven large enough to hold the peppers upright in one layer over medium heat. Add the olive oil. When the oil is hot, add the onion, and cook until softened, about 10 minutes. Spoon about half the onion into a large bowl to cool. To the onion in the pot, add the tomatoes, slosh out the can with 2 cups water, and add that too. Season with 2 tsp of the oregano, 1 tsp of the salt, and the red pepper flakes. Put the bread cubes in a medium bowl with water to cover. Let them soak 5 minutes. Squeeze all of the excess liquid out of the bread, and add the squeezed bread to the cooled onion in the bowl. Add the ground pork, grated cheese, eggs, remaining tsp oregano, and remaining tsp salt. Mix with your hands to make a cohesive stuffing. Cut the tops from the peppers, remove the seeds and ribs and divide the stuffing among them. Nestle the peppers in the sauce, cover and simmer until the filling is cooked through and the peppers are tender, about 1 hour. Serve topped with sauce. Mashed potatoes are also traditionally served.